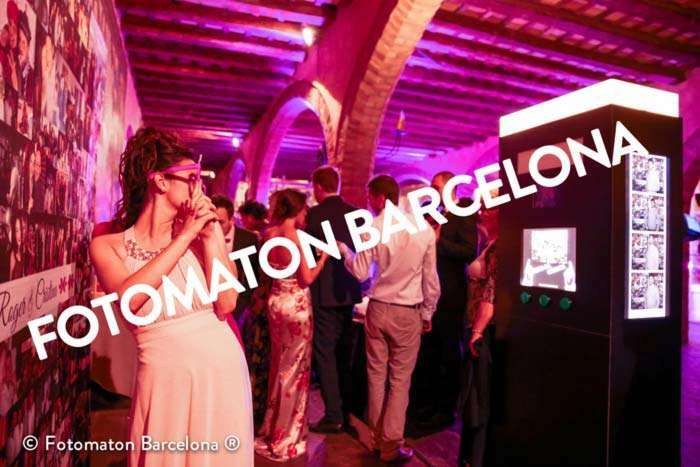 With more than a 650 wedding experience in the last four years, Fotomaton Barcelona truly knows what a spacial event a wedding is and how it must be realized with much care. Of course, when organizing our wedding we want every single detail to be perfect, we chose the venue, the invitations and even the flowers to match the tablecloth. Now, the latest trend and by far the most hip is wedding photo booths. 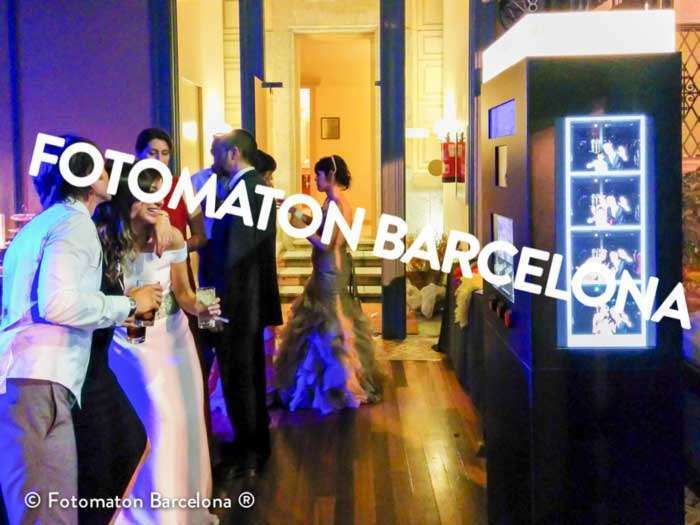 ¿HOW DOES FOTOMATON BARCELONA WORK? After savoring a delicious menu and an original cake comes the moment everybody if looking forward to. The music starts and the newly weds open up the dance floor and… The party begins! It is in this moment that Fotomaton Barcelona gains relevance. Costumes ready, photo booth on and the guests start to investigate. The more adventurous are the first ones to try it, they enjoy it, they dress up in different costumes and keep taking pictures until the shy ones start coming in. They like it too! Copies get printed at the moment. Unlimited copies for all the guests in the photo. This way they’ll be able to keep this memory forever. Plus, a spare copy is printed for the bride and groom’s personalized album. Every guest has the chance to leave a kind message next to their photo. We offer different album options, pens, stickers and color markers for a perfect finish. Also, a perfectly trained staff member will be accompanying you all the time to guarantee the best quality service. At the end of the event, once we finish our service, we deliver the album to the bride and groom together with a memory card with all the pictures taken. The quality of our photo booths is one of our main characteristics. Every photo booth is designed by us and has top quality photographic equipment. 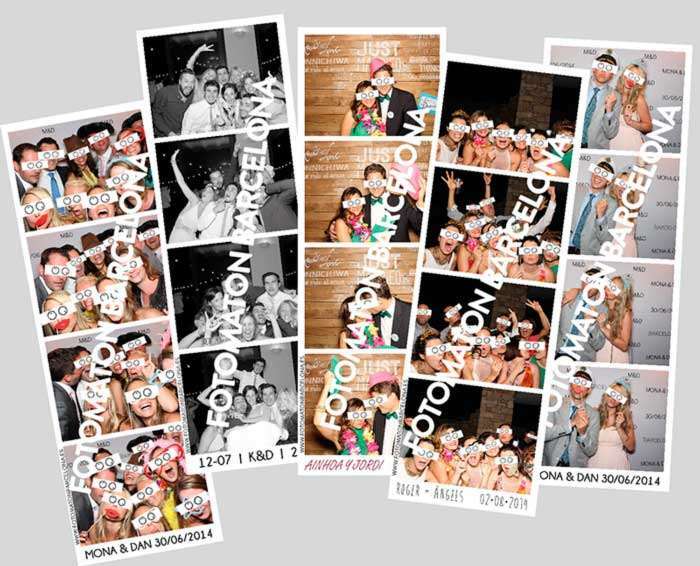 The basic format consists of 4 pictures displayed in a typical photo booth strip always customized for the event. Of course, we are open to modifications and will always help you choose the best option. All Fotomatón Barcelona equipments are vertical and are designed by our engineers. The goal of a wedding or event is to be fun and dynamic and we want to give the chance to your guests to take as many pictures as they want, also in groups. If we thought of the classic photo booth we would be very limited on that aspect. There are two types of wedding photo booths: standard and premium. The main difference is that premium has an ultra panoramic screen installed in one of the sides of the photo booth. The picture strips taken during the event will be shown randomly during the event, getting the attention of the more curious or those who are tired of dancing. 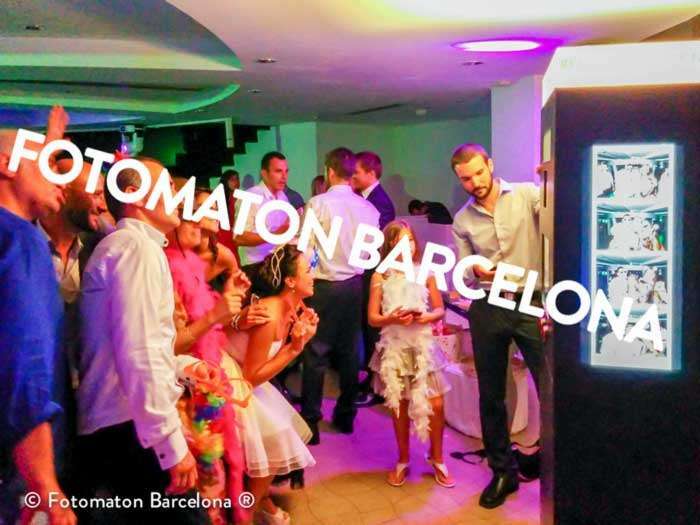 Also, if you are considering having a Photocall in your wedding, Fotomatón Barcelona can also be in charge of the production. WHERE AND WHEN DOES THE PHOTO BOOTH GET INSTALLED? Usually the wedding photo booth is placed near the dance floor or the bar. This way we combine the dancing fun with the picture taking. We are in charge of suggesting a privileged place with a table nearby to place all the costumes with an easy access and to comfortably create the album. We need approximately 20 to 30 minutes to install the photo booth easily and silently. If you desire to install the photo booth earlier we also offer the installation service before the guests arrival. All transport and installment services are given by Fotomatón Barcelona with our professional technicians guaranteeing an on time service, neat installation and assistance during the whole service. WHAT IF THERE IS A PROLEM DURING THE WEDDING? A professional and expert technician of Fotomatón Barcelona will be always with you. Ensuring the quality of the service and helping from the beginning to the end of the service in the well functioning of the photo booth and the guest confectioning of the album. Besides that, he will be in charge of making extra copies for every guest in the picture. All our staff members are dressed accordingly to your wedding protocol. HOW MANY HOURS DO I HAVE TO HIRE? WHAT IF WE WANT MORE FOTOMATÓN? In many occasions, once we are finished with our service, we are asked to add extra hours. If that is your case, ask our technician who will be able to expand the programmed schedule depending on availability. A 100-150 guest wedding usually has enough with a 3 hour service. For more than 180 guests an extra hour or two will be needed. 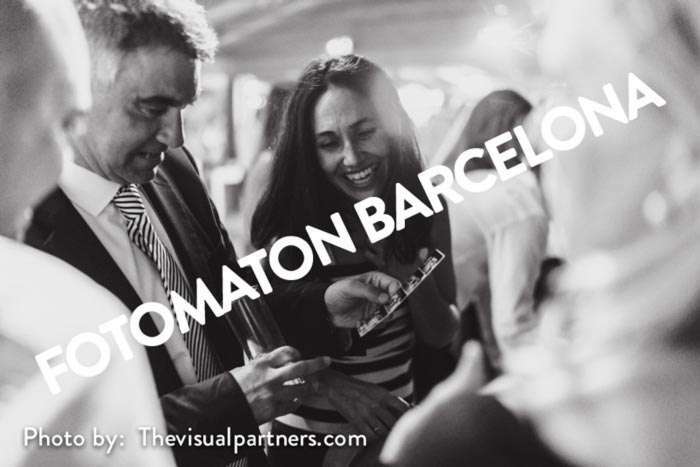 In Fotomatón Barcelona we currently offer a automatized synchronization service. If you’d like to share the moment with your friends you can do it in a private Facebook, twitter (etc) page of your election. Pictures will automatically be posted on the social network you have chosen. Remember you must hire this option to activate it. Reflex cameras. These are the most sensitive to light and remember the dance floor is usually dark. We are sure you don’t want moved photos or with much grain. Avoid compact cameras or webcams. This special day well deserves good quality memories. Flash lights. Photo booths may work with continuous light or flash light. Both options offer a good quality but… do you want a continuos light beam blinding your guests in the dance floor? Flash is with out a doubt the best option. Quality copies. The picture printing is the tangible memory that both you and your guests are going to keep. Avoid ink printers. Ask for a professional photography printer with instant dry to be able to print as many pictures as you want and store them in your purse without wrecking them.These type of printers also offer a longer durability. Photo strips. Not all photo booths can offer a 4 photo strip. Most will only print in 10×15 dimensions. Avoid having to cut your strips in the middle of the event. With our service you may also choose 2 different types of format (5×15 or 10×15 photo strips). 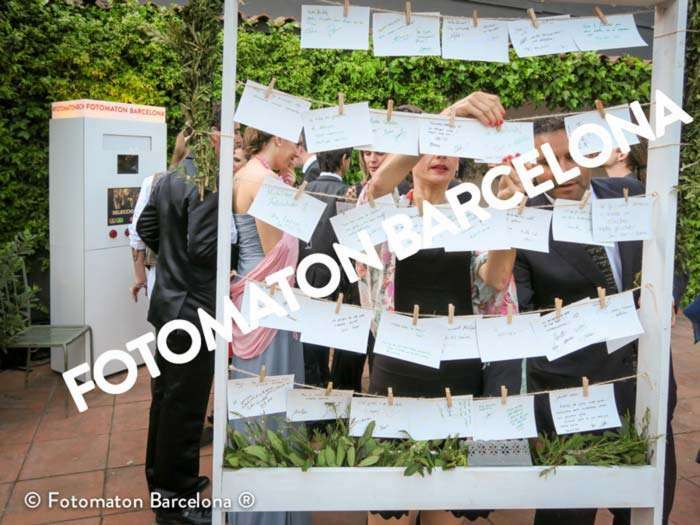 Fotomatón Barcelona was born in 2012 with the excitement of young enterprenours. Our goal is to improve day by day and offer a top quality service at a competitive price. The cabins are designed and built exclusively by us to commit to all the details and necessities the event might need. We have a vehicle fleet capable of transporting our fotomatones wherever we go ensuring the best service.